31 Things + A Birthday Giveaway! Today is my 31st birthday! I really liked being 30, so I’m ok with 31. Since the theme of my day is “31,” here are 31 totally random facts about me. (I stole this idea from my friend Katie, who also shared an awesome list on her 31st birthday!) Don’t miss the end of today’s post, there’s a giveaway! 1. I have a wild imagination. 2. I’ve never been to the ER or admitted to the hospital. 3. Making small talk is hard for me – I get flustered and say really dumb things. 5. I have a terrible fear of someone merging into the side of my car – maybe because it’s almost happened SO many times. 7. My favorite TV shows are The Andy Griffith Show and The Office. I could watch those two shows over and over and never get tired of them. 8. My top 5 favorite movies are McClintock, White Christmas, The Philadelphia Story, When Harry Met Sally and State Fair. Old movies for me! 9. I play the piano – my favorite is to play for congregational church singing. 10. My first cat, Fluffy, lived to be 21 years old. I got her when I was 3 and I still miss her! She was a mean, moody, beautiful part Persian that I loved in spite of herself. 11. I’ve lived in Tennessee, Indiana & South Carolina, and I spent eight summers in North Carolina. TN and NC are my favorites! 12. When I was growing up in Indiana, I desperately wanted to be a Southern girl. I met some girls from Georgia on a weekend teen retreat and came home with a thick Georgia accent. My parents laughed at me. Can’t imagine why. 13. I’m basically afraid of the dark. 14. I met my husband at the summer camp where we both worked – that summer I was a college freshman and he was a junior. I had a crush on him but he didn’t really notice me. Seven years later I ran into him at a basketball game where this time – he noticed me. 🙂 The rest is history! 15. I’ve never had a sense of smell. 17. My sense of direction is nonexistent. I get lost in stores (no joke) and things like remembering where I parked are truly stressful! 18. In college I majored in International Business. The classes were very hard and I graduated Thank the Laud! 19. My minor was German. No, I cannot speak or understand a bit of it. Fail. 20. I hated college but loved working at camp every summer. 21. I was homeschooled except for 3rd-5th grade, when I attended a very small Christian school. 22. I’m an iPhone girl but also a PC girl. 23. Louisiana is the farthest West I’ve ever been. 24. My idea vacation is a week in the Smokies. I don’t care for the beach – it’s too hot and windy! 25. I love filling out paperwork. 27. Comedy is one of my love languages. I love funny people! Tim Hawkins, Brian Regan and Chonda Pierce are some of my favorites! 30. Trying to begin these without “I” is very tricky. Ha! In celebration of today, I am giving away a collection of a few of my favorite things to one of you! 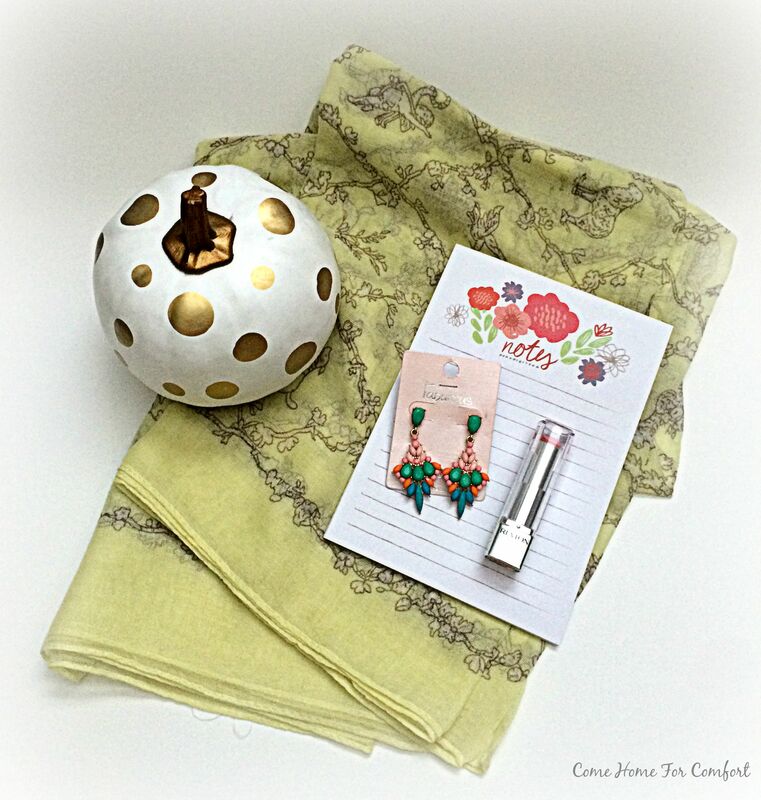 One of you will win everything pictured below: an infinity scarf & a pair of earrings from Cents of Style, Revlon Ultra HD Lipstick in the shade “Tulip,” a magnetic list and a little something glam for your fall decor! Here’s how to enter the giveaway: enter your name and email address in the form below. That’s it! You might have to scroll inside the form to see the “submit” button. If the giveaway form doesn’t load properly for you, click here to be redirected. Disclaimer: This giveaway is open until Saturday night (9/26) at midnight. Only one entry per person. This is not a sponsored giveaway, everything was purchased by me. Happy Day After Birthday!!! So many similar things – Philadelphia Story & The Office – just to start 🙂 No sense of smell? Wild! I always wanted to be a Southerner too. And I’m totally afraid of the dark too. I have night lights everywhere in the house! What a fun post!! Big birthday hugs! Happy birthday, friend. #bbn! Never would’ve peggedout for a Nascar fan. I don’t drink either. I think you’re the 1st person I’ve met without a sense of smell. Super interesting list, and lovely giveaway! Happy Birthday. Hope you’ve had a lovely day. Happy birthday, Whitney!!! I enjoy your blog so much. Hope you have a wonderful day and that you may find at least 31 blessings to count today. Thank you so much! I’m sure I could count 31 blessings (and keep on counting!). Happy Birthday from Germany! I’m a constant reader of your blog and especially love your organization tips. Happy Birthday Whitney! Have a wonderful day! Ha! I didn’t mean to click submit yet. #3 is hard for me to. I always say something ridiculous! My husband thinks it’s hilarious. Happy Birthday sweet friend! I hope your day is wonderful. My cat’s name is Fluffy! Tennessee is my all time favorite vacation too! Have a wonderful day! I hope your Fluffy is nicer than mine was. 🙂 Thank you for the birthday wishes! Happy Birthday Whitney!! Loved reading your list. You’ve got to head out west some day – it’s beautiful!! Not too hot, lovely views and no beaches in sight 🙂 Also, loved reading about your love of filling out paperwork, fears of someone side swiping your car (after being in a few accidents I swear I had PTSD) and have you ever been to the town where Andy Grifith was filmed?? It’s supposed to be pretty fun for AG lovers. I’ve recommended it to my parents because they are also big fans. What a fun giveaway!! Hope you have an extra sweet day and that this is the start of a wonderful year for you. Thank you, friend! Oh yes, I’ve been to Mt. Airy, NC twice for “Mayberry Days.” I’ve even met a few of the actors from the show! Your parents would love it! Happy Birthday Sweet Whitley!! Some of my favorite college memories are from times when we would get together for “German conversation time” (HA!) and getting ready in the mornings when we were roommates… we both understood there was no talking before a certain time, and then the music went on 🙂 Great times! Enjoyed learning more about you. You have a great blog! Happy Birthday Whitney! Hope you will have a wonderful day!! Happy Birthday Whitney! I really enjoyed learning more about you! God Bless! 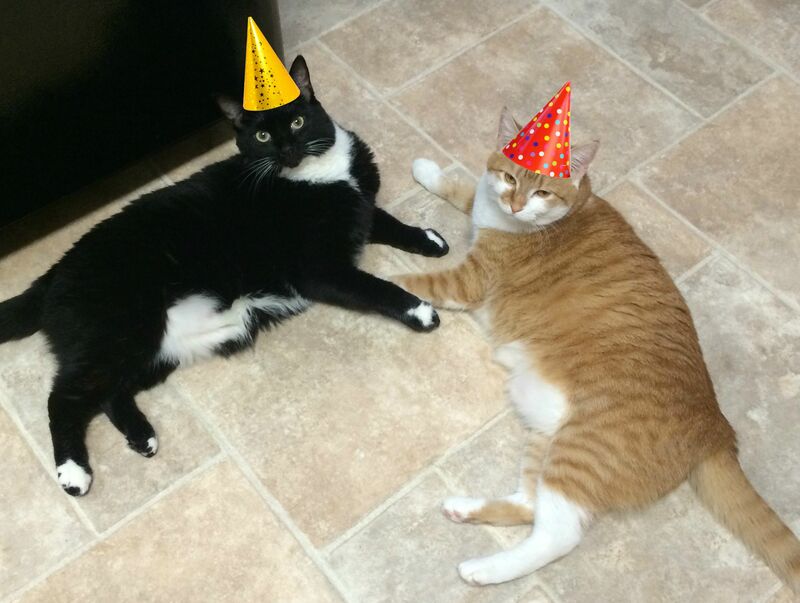 Happy Birthday to one of my favorite blog friends! So glad we came to know each other this year! I hope your 31st year is one of great blessings from the Lord for you! I am not entering the give away since I won the last one! I still can’t get over that you are a NASCAR fan! If you ever make it to Telladega I will come and have lunch with you! We are about three hours away! And have you ever heard of an Erin Condren planner????? Heard about it through MOPs. I was fascinated until I saw the cost! It is an organizer’s dream planner. I may have to save my pennies for one! Happy Birthday! Wish I was closer so we could have birthday lunch @ Trio’s! Love all the 31 plus more things about you. Aww, thanks friend! I would love that too! I always love hearing from you, Linnie! I’m so glad you’re enjoying the recipes! Thank you, Amy! I love that…I could definitely keep a list! Ahhh!! I love it every year when you say that! Thanks, Big Mama! Ow! Happy Birthday Girl!!!!! My hubby’s 32 birthday was last Tuesday so yall are a year and and week apart! I hope you have a wonderful day filled with yummy cake and suprises!!! This is lauryn sorry it’s showing me as an old user name! Happy belated birthday to Jacob! Thank you so much, friend! Happy Birthday. Ave a wonderful day! Happy birthday, my friend! I love this list, because I love reading these fun little insights into who you are. We share some common, favorite old movies and a love for filling out paperwork (something about how neat and orderly it all is makes my heart sing ;-).) Have a wonderful, wonderful day! Happy 31st birthday, sweet Whitney! I LOVE the picture of Thel and Peg! How in the world did you get them to cooperate?! I’m glad they’ll help you celebrate! Maybe someone will bring in a little sponge cake to work today. 🙂 Enjoy your day! Happy Happy Birthday Whitney! 🎉 I really enjoy your blog.